All privacy-conscious users know to watch out when a VPN says it provides free service. Is it trustworthy? How are they making money? Let’s find out the truth behind Touch VPN. Touch VPN is a free and user-friendly VPN service that allows users to protect their information with ease when browsing the web, streaming, and more. Mobile users won’t feel left out either, because Touch VPN also provides their service to Android and iOS users. Users can access websites from any country. Touch VPN claims they can protect users from hackers. Is it possible to get great service from a free VPN service? Read on to find out. VPN Speed and Performance: Wow, pretty damn good! For a free VPN service, Touch VPN exceeded our expectations. We tested two servers: the United States, and Germany. We weren’t able to test a Hong Kong server this time since the VPN does not provide servers from Asia. Some very very impressive results there. If nothing else, Touch VPN delivers some serious speeds (though this isn’t unexpected, given the relatively weak encryption protocols they’re using, which trades security for speed). Pricing & Plans: Absolutely, completely, free. Touch VPN offers their service completely free of charge. What’s not to love? Well, it’s free… but you’re paying it with a different currency. Your personal data – more on this below. You can buy an ad-free version of the VPN app, it runs for $29.99 per year on iOS, for example. Refund policy: Not needed, because again, it’s free! Touch VPN is a free VPN service, so a refund policy isn’t needed. Head to their website, download the VPN, give it a try. If you don’t love it, just uninstall it. Easy! If you’ve bought the ad-free upgrade, then the respective app stores may have different refund policies. Again, Touch VPN is free of charge and they don’t have any sort of donation options like some free VPNs do – but there is an option to upgrade through the app stores. Creating an account isn’t necessary to use their service for most platforms. For some reason, however, their Chrome extension has a sign in button. 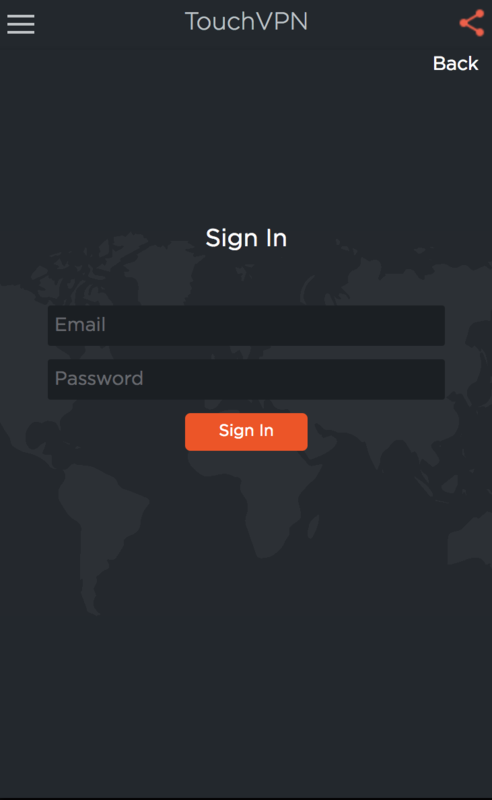 Their website itself lacks a sign-up button, so this left us wondering what the purpose of creating an account was. Weird. Touch VPN’s interface is a user-friendly interface that bares it all. 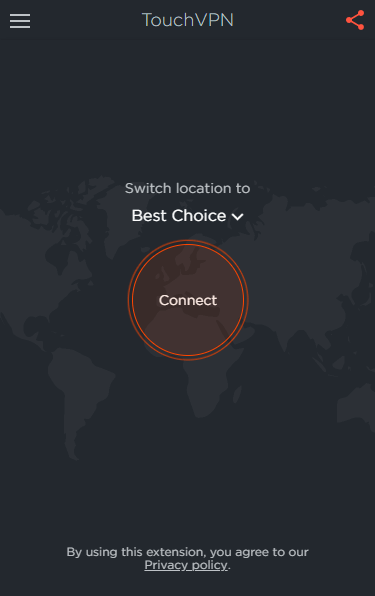 Users can immediately connect to the best server or a specific server with just a click or two (though you only have 7 to choose from, so it shouldn’t take long). The interface is neat, containing the connect button, server location, and sidebar for additional options. We tested the same servers of the speed test with the IP and DNS leak tests and we weren’t disappointed with the results. Touch VPN managed to successfully hide both our IP and DNS, during our tests – fantastic! Touch VPN’s services are accessible via Google Chrome, Mac, iOS, Android, and Windows. They’re the basic devices that VPNs are often compatible with. It’s a shame not to see an expanded offering, across platforms like routers, smart TVs, and similar – but again, it’s a free service, so we’re not going to get too upset about it. 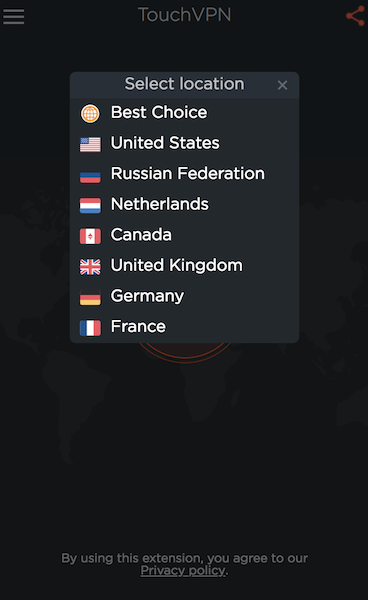 Touch VPN only provides seven servers in total from North America and Europe. Eesh. A little limited, don’t you think? Looking for Netflix and chill? You might be disappointed. It’s not you, it’s Touch VPN. 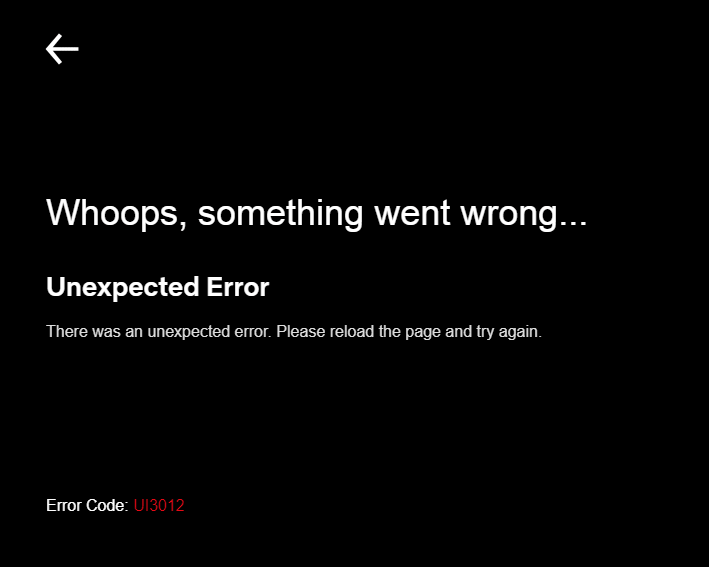 Their limited server selection doesn’t allow us to access Netflix, despite every effort to do so. If you’re searching for a VPN that’ll give you access to US Netflix from elsewhere in the world, or perhaps BBC iPlayer or similar streaming services, don’t put your trust in Touch VPN; we had no success, and wouldn’t expect anyone else to have much luck either. Need that Netflix hit? Check out our best VPNs for unblocking Netflix article. Much to our disappointment, Touch VPN doesn’t support torrenting. So if you were hoping to download some content, you’re out of luck here, too. Free services usually restrict their offering in this way, due to the risk it poses to their business for illegal downloading from many users. Still, with paid VPNs offering torrenting support and managing to operate despite the risks, it’s disappointing to see the lack of support here. Looking for a VPN that offers torrenting support? Look no further than our best VPN for torrenting article. Sad to say, Touch VPN has bad customer support. A help or contact button is nowhere to be found on both their chrome extension and their website. We had to search for their contact details online, only to find an online page that contained very little help. They are only contactable by email, something you may not wish to do. When we checked out the domain for their support email, we found that it wasn’t connected to any website. You can try emailing [email protected] and see if you get any response! There’s no live chat support or a dedicated help page – yeah, the service is free, but some support for the platform still would have been nice to see. Like we said, there’s no real help page and the FAQ section on their website is abysmal. As you can see, this is not a real FAQ page. The answers are all the same filler text that doesn’t answer the questions at all. Anonymous information: Including geo-location, the date of your last use of the Services and respective timestamps among many others. Personal information: Including name, email address, screen name, and payment and billing information. More personal information such as profile picture, birthday, gender and preferences may be accessed by the VPN if a user links it to a Third Party Account. Other information: Data from the cached copy on your device collected by websites you visit. The data is collected via cookies, pixel tags, and web beacons. Touch VPN collects information that most VPN services don’t collect, and we’re weirded out by how much data they do go to the difficulty of collecting. Their policy states that they don’t share a user’s private information unless it’s consented by the user or required by laws or court order. Additionally, they share a user’s anonymous information to third parties for marketing, research, and analytics purposes. Meaning if a product is free, it’s usually your data that’s making the company money. Worth bearing in mind, if you’re looking for a free VPN option. The VPN only supports PPTP protocol, an outdated protocol that has already been compromised. The only advantage of having PPTP is that it usually performs faster than OpenVPN and other more secure VPN services – but at the cost of your security. 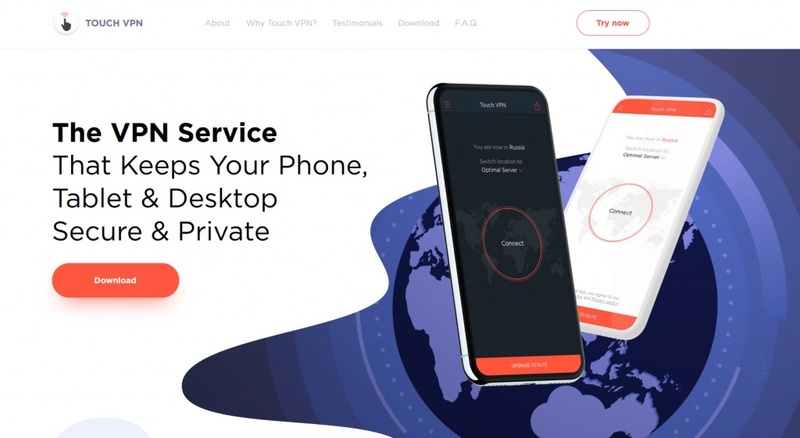 We would only recommend Touch VPN for users looking to access some websites that are geo-restricted, but not for users who are looking to secure their sensitive information and hide their activities from others. The absence of a kill switch is a disadvantage but let’s remember that Touch VPN is free. Honestly, we weren’t expecting to see a dedicated kill-switch, so this came as no surprise. The day we test a free VPN that offers a kill-switch is the day we will be thoroughly surprised (and impressed!). On their website, there’s no button to access the page for the creators of the VPN which most VPNs offer, so we can find out more about the history of the VPN. We only found the creators of Touch VPN via the download website of their chrome extension. On their website, it says the company Northghost provides the service but upon checking the Microsoft store version, another company named AnchorFree Inc. seems to provide the Microsoft service. So who’s who, really? Very suspicious, indeed. But AnchorFree Inc. sounded familiar. Very familiar. It’s the same company that produced Hotspot Shield, Kaboom, and Privacy Wizard. The same company that recently raised $295M in funding. 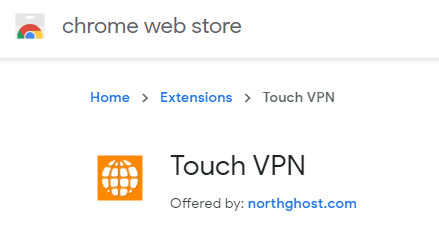 Perhaps Touch VPN was acquired by AnchorFree. It does have 10+ million installs on Android alone. Since AnchorFree Inc. is the company we have some information on, we’ll use that as the basis for judging their jurisdiction. As a California-based company, Touch VPN is under the 14 Eyes Alliance, meaning all that data Touch VPN is collecting could quite easily find its way into the hands of government agencies across 14 different countries. A scary thought if you’re privacy conscious. It is worth noting that they do have a branch in Switzerland as well. Will they move operations there for their strict data privacy laws? Only time will tell. Touch VPN’s $0 price tag might lure you in but proceed with caution. Sure, they provide unlimited bandwidth, good Internet speeds and hide your IP and DNS. The good news ends there though; everything else is suspicious, if not downright disappointing. Touch VPN logs so much information for a VPN service, it actually shocked us. VPNs are for data protection in general, not data logging. Additionally, they give your information to third parties for marketing – realistically, it’s how they’re making money from this business. Determining the owner of Touch VPN can also leave you frustrated, with contrasting results. 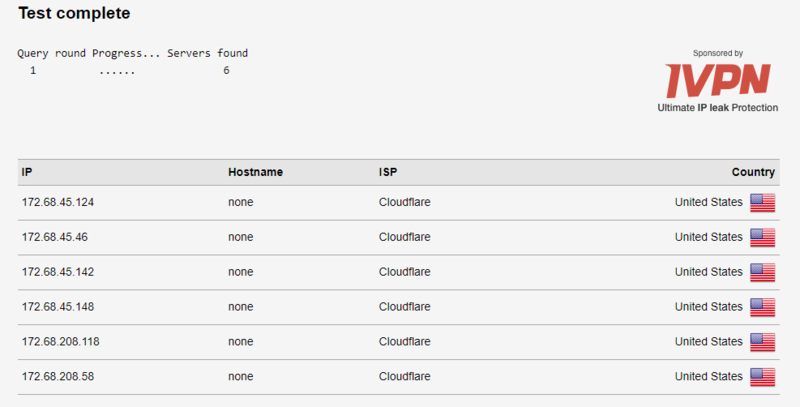 Is it owned by Northghost, a company we have 0 information for, or by AnchorFree Inc., a California-based company? If it were really owned by AnchorFree, this raises even more questions. A VPN having a terrible logging policy and being under the 14 Eyes Alliance while under the same parent company that promises to protect your personal information? Sounds incredibly off. The VPN is only supported by the PPTP protocol, which is weak and already an insecure protocol (due to already being penetrated). No torrenting support, no Netflix access, and there are very few reasons to bother trying Touch VPN; no security, no streaming or torrenting – what exactly is Touch VPN useful for? What we do know is this: if you’re looking for the best VPN services available, you need look no further than our top 10 picks right here.